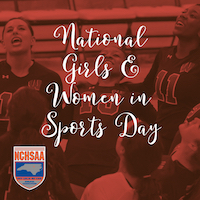 The North Carolina High School Athletic Association is proud of the significant impacts made on the Association by the many women who have dedicated their lives to teaching, coaching and organizing high school athletics across the state. Reflecting on the impact of these women, we wanted to recognize females in Athletic Administrator roles across our state. From school Athletic Directors and Co-Athletic Directors to City/County Athletic Directors, these women have dedicated their lives and careers to serving the young people of our state and we honor them today.